Bizzy Bear attends a Halloween party. 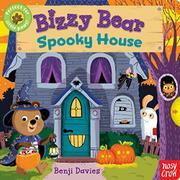 Bizzy Bear enters a spooky house on Halloween night. As the friendly critter follows a dog butler through the house, readers are able to slide panels that make portraits’ eyes move, bats and animal witches fly outside, doors open and close, and more. The story ends in the attic, where a Halloween bash is in full swing. The illustrations eschew the Bizzy Bear books’ usual bright primary color palette and swap in dark purples, greens, and oranges. The comfortably rounded Bizzy Bear character stylings are still there, but the backgrounds incorporate harsh angles in their compositions to make the environment all the spookier. The sliding panels and tabs are sturdily constructed, resistant to even the harshest tugs from spooked toddlers. The shifting environments are particularly creative, drawing little readers into the creepy environment but still keeping this fun instead of truly scary.